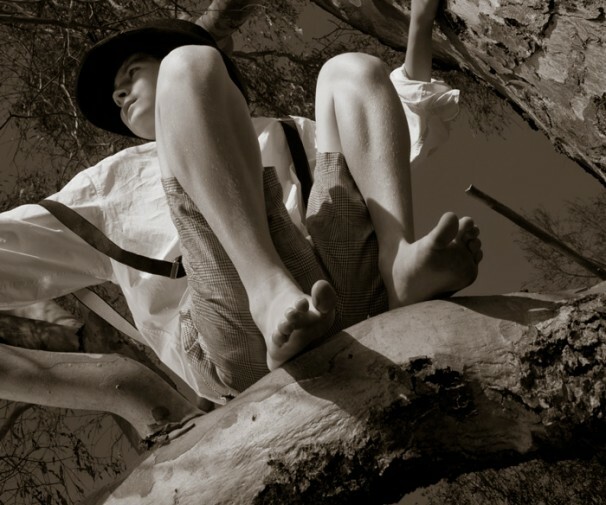 It is a pleasure to present the 2012 George Fairfax New Theatre Award winning play The Republic of Trees: a Tale Between Earth and Sky, a multi-artform promenade theatre adaptation of Italo Calvino’s Il Barone Rampante (Baron in the Trees). Presented amidst the tree-scape of the historic Vaughan Springs Reserve, an intriguing story unfolds: one fine evening, Cosimo Piovasco di Rondò, the son of a wealthy Baron, climbs a tree in his backyard and swears never to come down. Ranging from the swashbuckling to the intellectual and the amorous, The Republic of Trees is unique arboreal theatre — perhaps ‘the ultimate tree change’. A promenade twilight performance will take the audience on a travelling theatre experience through the dramatically beautiful Vaughan Springs Reserve. The action takes place as much in the trees above the audience as on the ground. This exceptional work — 9 years in the making — is unmissable theatre. Adapted from the original Calvino by multi-award-winning Australian author Wayne Macauley, and featuring a stellar cast of some of Australia’s circus and physical theatre glitterati, The Republic of Trees will resonate well beyond the performance itself. Live music composed and performed by Chris Lewis and Jenny Thomas. Quarteracreblock acknowledges the indigenous traditional owners in all areas of Australia in which we work. We recognise their continuing connection to land, waterways and community. We pay our respect to them and their culture, and to their Elders past, present and future. Many Thanks to collaborators Miranda Jacques, Susie Dee, Black Hole Theatre, Vaughan Springs Vineyard, Friends of Vaughan Springs, Guildford Upper Loddon Landcare, Noel Muller Parks Victoria, Circus Oz, Anna Tregloan, Wally Williams and Dislocate Physical Theatre. Dress for the outdoors! Be prepared for an adventurous night out. Audience advised to wear warm clothing and comfortable footwear.